I’ve owned several different camera bodies over the course of time. I started with a Canon EOS 400D (Rebel XTi) entry-level camera. 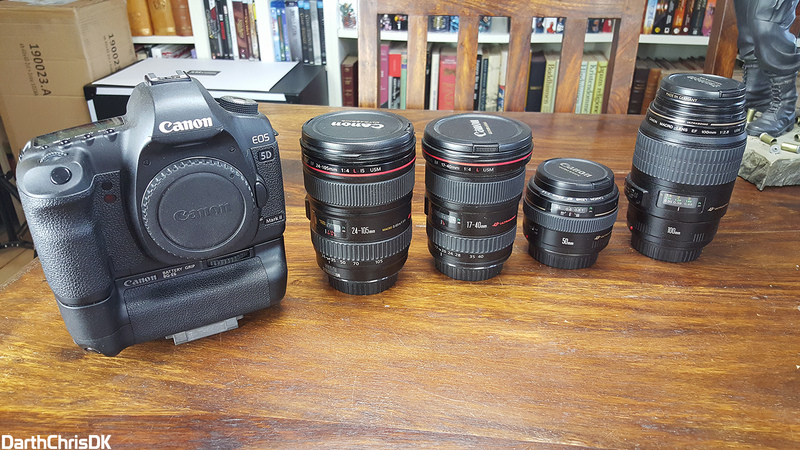 I then replaced it with a Canon EOS 7D, but I shortly after decided to upgrade to full-frame instead, and I got the 5D Mark II, which I’ve been using for the last 4-5 years. I won’t go into too much detail about the differences between crop sensors and full-frame sensor. That’s a story for another day. 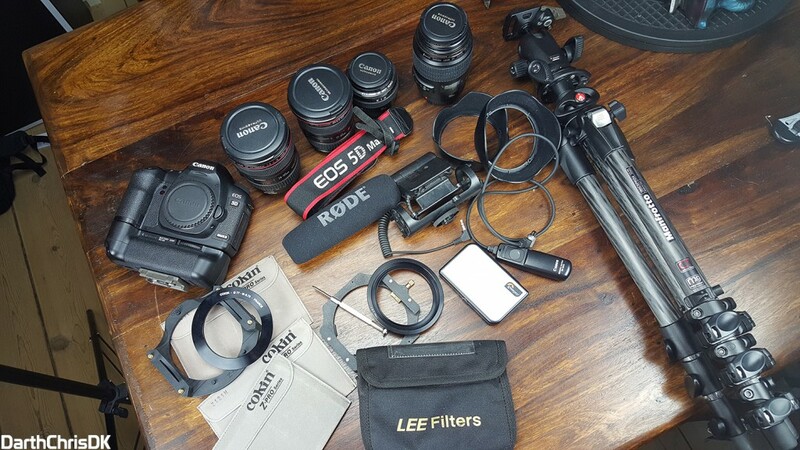 I have a reasonable selection of lenses, and most of them I have obtained after jumping to full-frame. Prior to this, I also had a Canon EF-S 10-22mm USM, but I replaced that with my 17-40mm f/4L – they are more or less similar in terms of angle. I like to have a lens for every situation, and also ones that offer unique creative options. I find myself using my 24-105mm f/4L almost always, but I do vary between my 50mm prime, my macro and my ultra wide angle. It all comes down to the situation I am in, and what I would like to express on the photo. I’d like to add a 70-200mm f/2.8L to the line-up, but right now, I don’t see when and why I’d really need it. But it is definitely something I’d like to add anyways – some day. A tripod is one of the most important tools, in my opinion. Especially when taking photos of still objects. 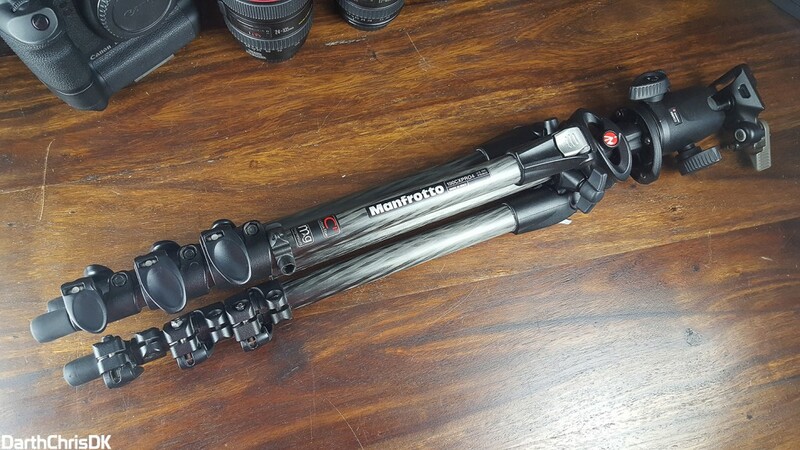 I have a lightweight carbon tripod with three sections on each pod. This makes it possible to adjust the tripod in basically all thinkable heights, within its range. There’s a center bar as well, which can be extended so that tripod is even taller, and it can also be adjusted as a crossbar so I can use the tripod extremely close to the ground. It’s a very versatile tool, and it makes it much easier to take sharp photos in low-light situations. I therefore highly recommend that you add one of these to your toolbox. I have a ball-head mounted on the tripod, which makes it possible to lock the camera in countless unique ways for more creative angles. It features a quick-release plate, which is also very useful. It can be seen underneath the batter grip on the picture above. 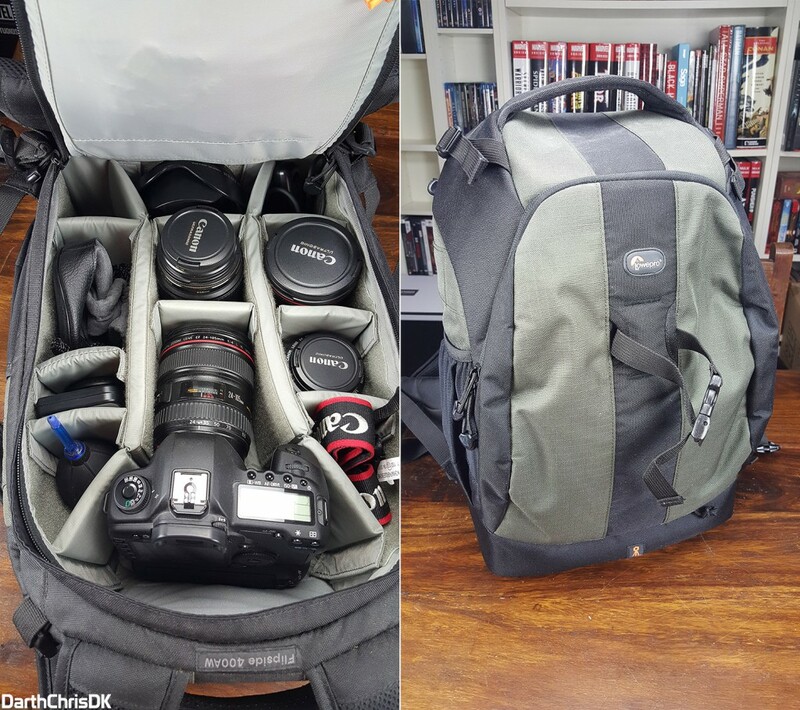 I pack all my gear in a Lowepro Flipside 400AW. It can contain pretty much all of my gear, but that’s also about it. So, if I were to upgrade, with a new camera body or a telephoto lens, I’d need a new bag. I’ll worry about that once I get there. Let’s not forget to talk about lighting. This is definitely one of the most important aspects of shooting good photos. I’ve been using two umbrellas on stands for a long time. Each has a light bulb shooting out neutral light ~ 5500-5600 Kelvin. 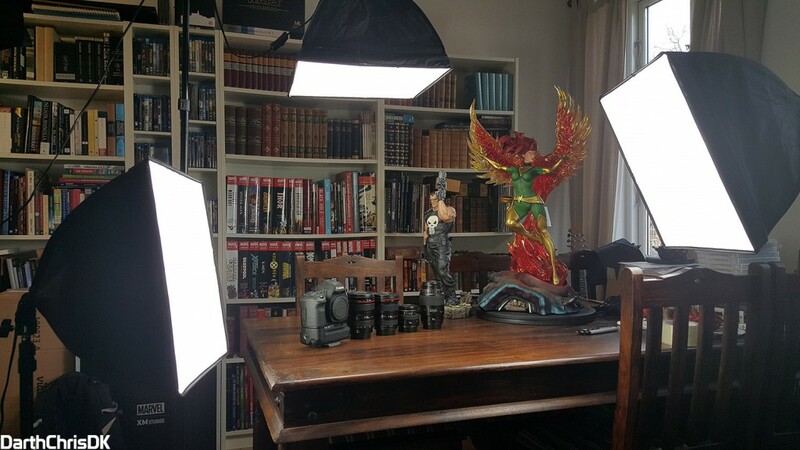 I’ve since added three softboxes that will be my main source of lighting in the future. Two on the sides and one from above. I plan on doing more articles and guides in the future on the topic of shooting pictures and recording video. 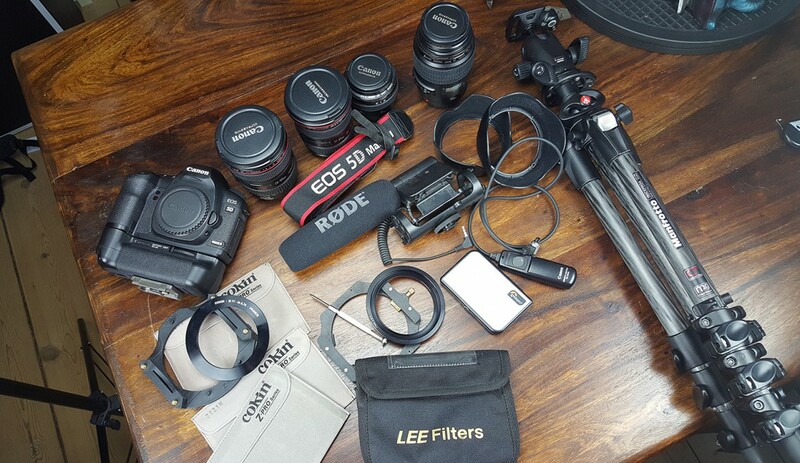 Therefore, I won’t go into too much detail about that here since this is more about sharing what equipment I use. That’s about it, I think. In the future, I plan to upgrade my camera to a newer model. 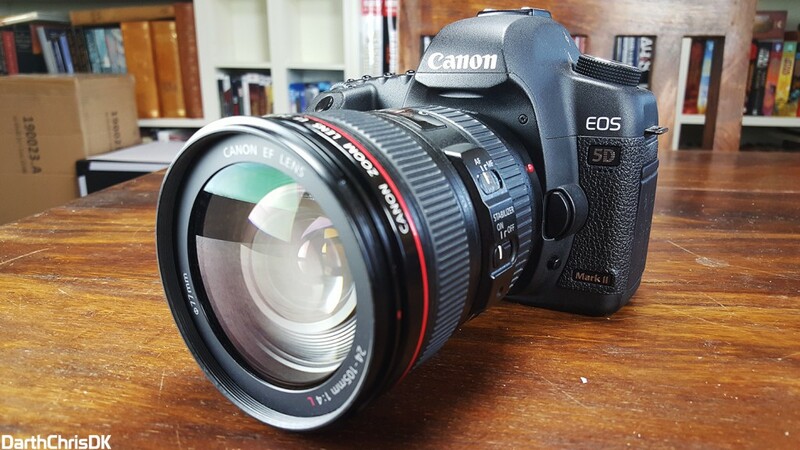 I think I’ll keep my 5D Mark II as back-up or secondary. Rumour has it that the 5D Mark IV will be out sometime next year, and I think that will be my next camera. Thanks a lot for reading. If you have any questions let me know. PS. Ironically, all photos in this article were taken with a phone camera – Samsung Galaxy S6. I think it did an OK job. Couldn’t really use my camera, for obvious reasons. 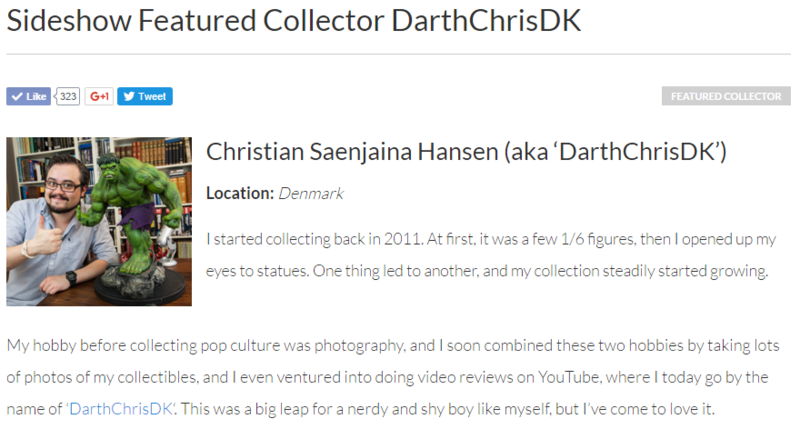 Hey DarthChris – great photos of your collectibles for sure. I would think you would use the macro for a lot of that instead of the 24-105… I’m on the Nikon system myself and just started shooting some of my (albeit small and less expensive) collection. Hyped at getting a Tokina 100mm macro soon and seeing what I can extract from that. 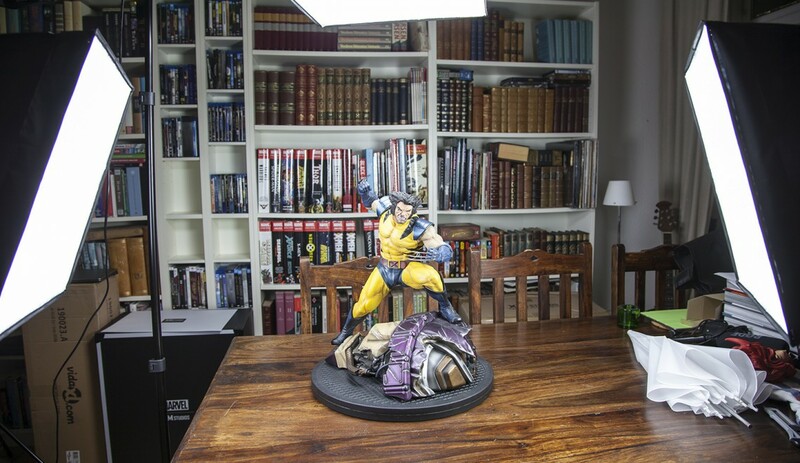 If anything I’d love to see you share more of you camera gear/ lighting in the future. As of now I don’t have the space to really do anything intricate but if I did I’d get a small studio going like yourself. Cheers and be well. Hi Kris. Thanks a lot, buddy. I think it’s in part due to laziness that I don’t use my 100mm more than I do. It does give me so many cool options, though. The Tokina 100mm Macro is an awesome lens, and I’m sure you’ll be very pleased with it. I’ve been thinking about doing more photo related stuff on this blog i.e. guides, post-production tips in Photoshop etc. I often get lots of questions and that’s why I made this article in the first place. So doing such stuff in the future is definitely on the table.